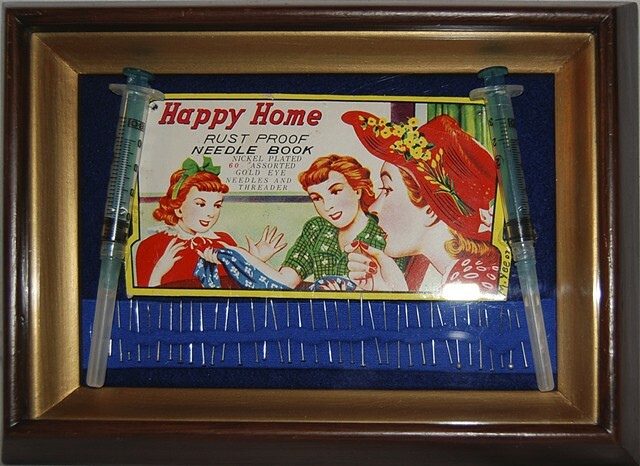 The vintage needle book illustration and text pose a different point of view from my personal experience. Some homemakers are not content and may cope in different ways. In a social setting a homemaker may appear happy. In reality many unhappy things may be going on in the home. The presence of sharp needles represent the prickly verbal, sexual and physical abuse. These hypodermics are actually in vitro fertilization needles. An unsuccessful pregnancy produced a sad home for a period of time. “Rust proof” sparked the thought of middle age and dwindling old eggs, diminishing hope of conceiving, and having the chance to teach a new being.